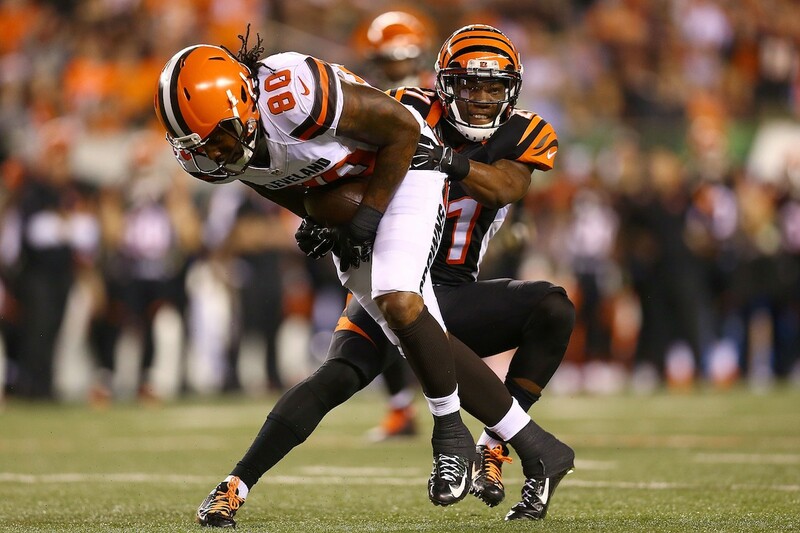 Dwayne Bowe is by all measures a halfway decent receiver. He made the Pro Bowl in 2010 as a member of the Kansas City Chiefs, and holds the franchise record for most catches by a Chiefs wide receiver. Even during his final two seasons in Kansas City, he averaged 58.5 catches and 713.5 yards. He's 31 years old; plenty of receivers his age and older are still productive members of NFL rosters. So how in the world do you explain his season in Cleveland this year? The Browns thought they were getting a potential No. 1 receiver when they signed Bowe this off-season for two years and $12.5 million. Instead, they got perhaps the most disappointing free agent signing in NFL history. Bowe finished the season playing just seven games, catching five passes (and only recording a catch in two of those seven games) for 53 yards and no touchdowns. The most baffling part is that Bowe appeared to be healthy all year. He was simply a healthy scratch in more than half of his team's games. Because of the way his contract is structured, Bowe will still receive $9 million from the Browns this year. Let's break that absurd amount down by statistic–this means he got paid $1.8 million for every catch he had, $169,811 per yard, he gained, and $1,285,714 for each game he played in. Talk about a good life! Bowe was hardly alone, either. A few other players made a ton of money without having to do much on the field. And these are all guys who were either benched due to poor play, or simply didn't perform on the field. Injuries happen, so we'll try not to dismiss those players too much. Colin Kaepernick earned $12.8 million this year, despite being benched eight games into the season. His final numbers? 144 of 244 passing (59%) for 1,615 yards, with six touchdowns against five interceptions. Every touchdown pass cost the Niners about $2.13 million. Fortunately for San Francisco, they included a clause in Kaepernick's contract, stating that if they cut him by April 1 anytime in the next three years, they won't have to pay that year's salary. Silver lining, at least. Bills' defensive tackle, Marcell Dareus, was supposed to lead a vaunted defensive unit, but Buffalo could never put everything together. Dareus only recorded more than four tackles in a game once all year, and had just two sacks, the lowest he's ever had in a season. Thanks to a hefty signing bonus, Dareus earned a little more than $7.8 million this year, making each sack worth about $3.9 million. And that's still a bargain compared to the damage the Bills will feel over the next four years–his cap hit each season is at least $14.5 million. Mike Wallace came to Minnesota believing he could be a No. 1 receiver. He did have a six catch, 63-yard performance in the opener, and nabbed eight passes for 83 yards in a close loss to the Broncos. But outside of that, he never recorded more than four catches or 49 yards in a game. In fact, he played in three games where he didn't even have one catch. Not exactly how both Wallace and the Vikings thought things would play out when they acquired him from the Dolphins. Despite a down year, Wallace made $9.9 million this season. That's $4.45 million per touchdown catch. But on the bright side, the Vikings are in the postseason, while the Dolphins weren't even close. Finally, in a curious move, Cowboys LB Sean Lee sat out the season finale against Washington. Had he suited up, he would have played in 80% of the team's defensive snaps this season. And thanks to an incentive in his contract, he could have earned a cool $2 million. But maybe being less sore and getting an early start on vacation is worth the tradeoff. In a perfect world, free agent deals would always work out, but too often after committing big money to a free agent the player ends up being a dud. Over the years, there have been some epic ones; guys who were paid well, only to play terribly. When Will NFL Teams Quit Overpaying Wide Receivers? Things weren't as unpredictable as last week, but there was still plenty of wild action out on the field. Here are the highlights in case you missed anything.